SO WHAT HAD HAPPENED WAS…my iPhone locked up today. There was nothing I could do. So, if you sent me a text, replied to my last text to you or called me after 10 am, I didn’t see it and I will never see it. Ever again. I wasn’t ignoring you. So if someone professed their undying love for me I’ll never know. LOL! But, feel free to send that one again! I have lost ALL texts messages from the last year and a half. :-( And you know sometimes you have phone numbers and addresses in those texts messages. Oops. Anywhoo, I only have a few unchecked voicemails from April. My last back up was in March so any pictures I took after that back-up…gone. I sure hope I downloaded the ones I took in Nashville! I know I didn’t download the ones of me and De Renee and friends from the last week or so…so I guess we need to take some more. Bryant Carter, um, can you send me some of the pics you took last week, please sir? Anyway, if in the last few months you sent me pics of your lovely kids and family via text message, I no longer have them. I feel empty. And if I sent you some pics that I took, can you send them back to me, just in case? But all is not lost. Good thing is that I do still have most of my contacts and they are slowing coming back. But if you happen to send me a text message and you get a reply from me that says “who’s this?”…don’t get offended. I still love you, even if I don’t know who you are. LOL! I ended up going to the Apple Store (after lots of lengthy phone calls with Apple support) and they got me back on track free of charge. We didn’t want to do a factory reset, but it was necessary and it was better than having to get a new phone. They think because my storage was full (always) and some apps were trying to update and one or two of the apps were probably corrupt, my phone just said “I give up”…and shut down. For good. They don’t recommend backing up my phone from my last back up, because there could be something that would shut my phone down again. So I needed a clean slate. Anyway, I know this was long…but moral of this story: Don’t ever think that God doesn’t answer prayers. You just need to be specific! LOL! UPDATE: Thanks Derita for sending the above photo of us from one of your many “going away” events! Yay! Lately I’ve been experiencing some really good moments. And even when things have been bad, I’ve chosen NOT to focus on it. Life is choice-driven. Takes practice and lots of prayers definitely. BUT, I’m reminded that when things seem awful or difficult they won’t always stay that way. Though it usually feels as if bad times last forever. I’ve been extremely blessed lately and it has nothing to do with money or things. And maybe because of the fact that I’ve not had much money or many new things lately I’ve been able to focus on what I do have, which is a lot! My relationships with my friends and family and general acquaintances have made my life richer. Since losing my mom to lung cancer in 2012, I’ve really had time to step back and take stock in my life. Things definitely haven’t gone my way all of the time, but those bumps in the road have been true blessings in disguise. I know folks say that all of the time, but it’s really true for me. I’ve got an awesome support system, even if I don’t always use it…I still feel as if I’m ‘bothering’ folks. But knowing I can always call on anyone in my circle gives me so much comfort. Just knowing that provides a ‘good moment’. My steps are ordered and God continues to prepare me for great and awesome things. Every day I’m in awe at what He’s doing in my life. The more I do for God, the better I feel and the richer my life becomes. Take a minute to think about your good moments. What do they consist of? Loyal friends and family? Great job opportunity? New house? New baby? Kids graduate from school? The best part about this short exercise is taking time to recognize that you’ve got it good…even when it SEEMS bad. But honestly, how bad is BAD? Many of us have it much better than others. Be grateful today and bask in those good moments. 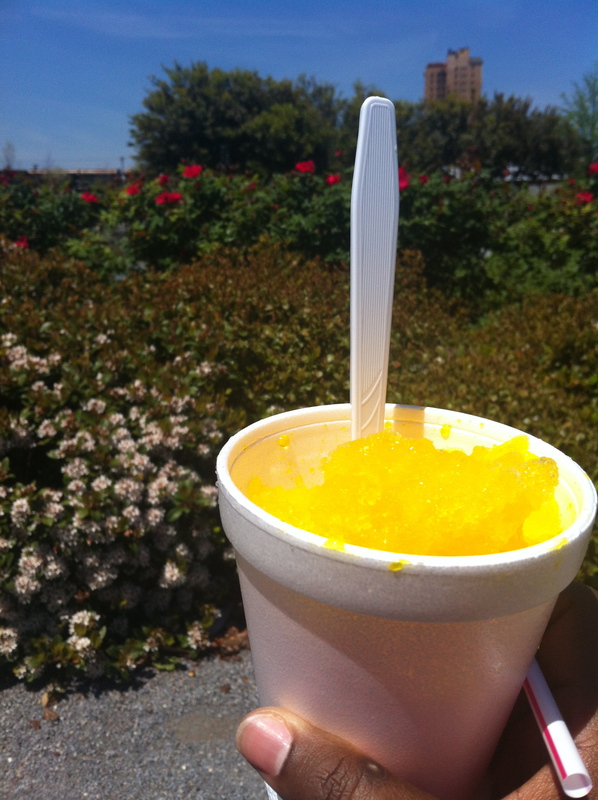 Enjoying a beautiful spring day with a NOLA Ice Snoball! How Can I Make My 2016 Better Than 2015? The many moods and musings of a big dreaming, Magic City woman. Facing terminal cancer at age 26.